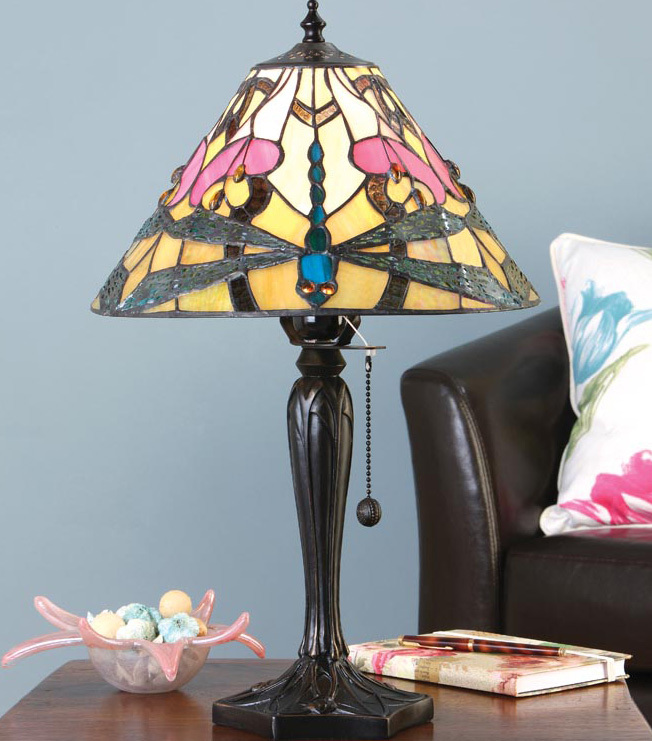 The Ashton medium 1 light Tiffany table lamp in an Art Nouveau style, based on the traditional Dragonfly Tiffany design but with an Art Nouveau twist. Hand crafted from quality art glass by Interiors 1900. Each piece has been inlaid and soldered by hand using traditional leaded glass techniques. A lovely 300mm diameter Tiffany table lamp, with a rubbed dark bronze finish traditional base and a hand made shade. The shade has base colours of creams that blend into pale gold and barley, inlaid with an iridescent dragonfly design around the edge and trumpet flower heads, with golden stamens radiating from the centre. A truly wonderful design Tiffany lamp that will take pride of place on your table.